Come for a holiday on the beautiful Isle of Arran in Scotalnd and Learn to fly! Take a 5 day Elementary Pilot Course. £550 plus BHPA membership. Payment by bank transfer to Flying Fever sort code 800584 account no. 00349579 or cheque. Please write your name as reference and send an email. We will send you vouchers. You can also arrange to pay by the day for £110 per day. 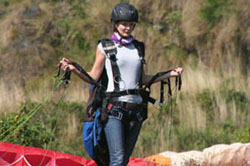 Weather: Paragliding is very weather dependent, it needs to be dry and the wind beneath 15mph. You book a day then phone the day before and again in the morning to check on weather conditions. We cancel if the weather looks unsuitable and rescedhule for another day. You need patience and no refunds can be given. You can arrange to pay on the day. There are some scheduled courses throughout the year - please contact us to let us know when you want to come. We operate daily when weather conditions allow. The school is open from April to September. * You need to buy BHPA 3 months Trial membership £75 or annual membership is £121 to do the course. You can sign up for it with us when you start. We follow the British Hang gliding and Paragliding Associations (BHPA) training syllabus that takes you step by step to the freedom of the skies. To progress quickly we recommend you do the training as close together as possible or spread over a number of consecutive weekends. You can either stay on Arran or travel over daily to fly. Training begins on a gentle slope learning to take off and land. We do some ground handling which allows you to learn the basic controls. Gentle flights from low down on the hill are extended higher up the slope as your ability and confidence grows. We use tandem flights and radio instruction to aid tuition. Techniques such as ground handling, gentle turns and accurate flight planning are taught. You progress at your own rate, your instructor signs off tasks in your student record book as you complete them satisfactorily. Theory sessions are given on weather, flight theory, airmanship and airlaw followed by a final exam. What to wear Ankle supporting boots, long sleeved top and trousers, thin gloves, hill walking clothes. Bring a packed lunch and water. Fitness - The fitter you are the easier it is to get back up the hill and get more flights done! You will be carrying a 12kg rucksack up a slope. You need to be medically fit and not on any medication that could effect you if in doubt consult your doctor. Risks - Paragliding is an aviation sport which involves inherent risks which are kept to a minimum by operating under strict safety guidelines in the correct weather conditions with the right equipment. But there still remains an element of risk. 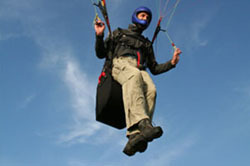 Weather - paragliding is weather dependent. You book a time that suits then phone the day before to see if the weather forecast is suitable for flying. If its not suitable the day can be moved to another day that suits you. If you are booked on a course we sometimes use a large hall as an indoor training facility to get you started. We also have mini wings that allows us to use stronger wind conditions. No refunds can be given, the course is valid for the flying season so you can come back to finish your course if you need to. You can arrange to pay for your training per day if you prefer. Watch a video of some training on Arran. Download the BHPA student training record that lists the exercises you will complete. The BHPA Elementary pilot course matches the syllabus of the Open Sky Pilot in the APPI international system. If you would also like to be registered with APPI then let us know. Download APPI Log Book and training record. You work your way through a series of exercises a book of your training is kept by the school with each excercise signed by you and your instructor. Any large gaps in training means you have to refresh your training before progressing. The book is still a guide in certain circumstances enviromental constraints may make it impossibe to progressively increase height / turns exactly as indicated in the text. In such situations the instructor may exercise reasonabe judgement in accordance with the advice contained in the Instructors notes. Objective: The student should have a basic understanding of the sport and its risks, a basic understanding of the equipment and the site enviroment and understand how to avoid/minimise injury as a result of mishap. The student must also complete the mandatory administration steps. 3. Introduction to canpoy and equipment Parts and functions of canopy, harness, helmet- how an aerofoil creates lift- daily inspections explained, demonstrated, practised and understood. 4.Avoiding/minimising injury Safety techiniques discussed, including parachute landing falls (PLFs) When and how to use them, demonstrated and practised to a good degree of competence. Objective: Through ground-based activity the student should achieve a reasonable and consistent level of competence preparing the equipment for flight, inflating the canopy, running with it whilst looking ahead, maintaining direction, flaring and collapsing the canopy. 7. Inflation Take offs practised to stage of running with an inflated canopy (forward/reverse inflation method as appropriate to the conditions) looking ahead - flare - collapsing the canopy- post flight control and moving of the canopy. 8. Directional control How the controls work for directional control- initiating turns - lookout and looking ahead. 10. Eventualities briefing The need to prepare before takeoff plans to deal with the unexpected. 12. Responsibilities briefing From this point the student becomes the "Pilot in Command" and will be in a position to determine the course of the flight. The student muyst claerly understand their level of responsibility for the safe conduct of any flight and be confident of their ability to undertake this step. 13. Flights Maintaining course and airspeed. The student should reach a reasonable and consistent level of competence and confidence flying at a increased ground clearance( max 15m 50 feet) and in making the directional control corrections required to maintain a straight course. At least four successful flights must be achieved. Direct communication from an instructor must be available. 14. Introducing turns The student should reach a reasonable and consistent level of competence and confidence whilst flying with a greater ground clearance (max 30m/100ft) maintaining good airspeed control and making gentle turns. The student should be briefed on turns, the need to avoid low turns and the need for lookout. The turns should be no more than 90 degrees (ie less than 45degree from directly into wind) Direct communication from the instructor should be available at least 4 successful flights must be made. 15. Completing simple flight plans The student should reach a reasonable and consistent level of competence and confidence when making flights with a further increased ground clearance. Flights should involve unassisted launches, turns of 90 degree or more with ggod lookout, good airspeed control and controlled landings within a defined area. The student should be briefed on turns and the need for lookout. At least 4 successful flights must be made. Any increases in altitude must be progressive. Objective: Through lectures, lessons, talks and personal study the student should achive the required knowledge level in theses subject areas. 19. Elementary stage examination. Completed and incorrect answers de-briefed and discussed. Final Assessment of Elementary Stage 20. I have checked that the training detailed above has been completed and confirm that to the best of my knowledge this student has the right attitude to flying and has reached the standard of airmanship required to continue training in this discipline.